by Cornell particle physics postdoc Yangyang Cheng who is self-evidently a profound political junkie – a homo politicus (with a physics PhD plus some political training at University of Chicago) who knows what she's talking about. The number of physicists, and especially female physicists, whose thinking about politics is this refined is tiny. That doesn't mean that I agree with her views about most questions. Her view on the "march for science" is clearly something I wouldn't sign, for example. She discusses the political implications of the Chinese collider that may be built near the Great Wall of China – surrounded by the Great Firewall of China. Maybe she finds the ideological purity of the project (I mean the neutrality with respect to national and ideological interests) even more important than I do but otherwise she's clearly on a very similar frequency as your humble correspondent. OK, so she interviewed an unnamed official of the Chinese Academy of Sciences by phone. After some problem-free exchanges, her last question was: "Will there be a unit of the Communist Party of China that supervises the collider project?" Now, this is clearly a rather fundamental question. Everyone who understands some politics and is interested in the project would like to know the answer. At some level, I think that especially the Chinese folks have a kind of a right to know the answer. The CAS official responded with a 20-minute tirade, personal attacks, and suggestions that Dr Cheng was killing the project because "politics is too sensitive". Wow. Can't you even ask simple questions like that? China's economy has become capitalist to a high degree. But the social and political system of the country remained communist and totalitarian. It's a strange combination but it's not unimaginable to me. I think that if the Perestroika of the 1980s continued for some time and the Velvet Revolution were avoided, we could have ended up with a comparable system. A difference from the West is that the communists are still the "ultimate bosses" in all sectors of the military, economy, and science – those are just limbs of one organ whose head is called the Communist Party of China. Lots of the "fully adapted" Western scientists say that China is totally free and the communist party stuff is just an irrelevant formality. But Dr Cheng knows better. It's simply not the case. It can't be the case. At the end, every project like that is just a tool to strengthen the Communist Party of China – either its ideology, its identity, or the Chinese national glory. How many and which abuses and idiosyncrasies linked to communism they're willing to tolerate so that they still think that the collider is a net positive? Are these abuses and idiosyncrasies really worse than those in the West? Aren't they just variations of something we know from the West, anyway? If one places these things under control, how can one fight so that the worst unacceptable effects are avoided? Now, when I talked to folks like Nima Arkani-Hamed or Andrew Strominger after they visited China, they would praise the country for its immense freedom etc. Well, I was obviously skeptical at most times. It could have been laziness to some extent; but there was some genuine fear which decided that I have refused several offers to visit China or Iran. I just don't think that the countries are safe – at least for people like me. Even Czechoslovakia wasn't really safe for the likes of me before 1989 – well, one could argue that the U.S. Academia wasn't safe, either – and I think it's obvious that the totalitarian countries are worse. Cheng discusses the "general indifference" among the Western scientists who choose to cooperate with the Chinese project. The general meme is that the communist influence is just a formality. Well, I have lived in communism and I know that the communist control cannot ever be just a formality. If it were a formality, they would have noticed and the units would have been canceled. The communist units in every company or project decide about the existentially important issues of the political type. If something becomes inconvenient for some vital dogmas of the communist party, the communist party units act. They fire the people or do something worse to them. They try to promote this political influence to foreign institutions, too. Cheng mentions some details or examples. But his hypothesis, well-intentioned as it was, reveals a deeply simplistic, caricatured understanding of state oppression. True terror and totalitarian control come after the tanks have left the square, when blood is wiped off the streets, the history books, and the people’s collective consciousness, when a date becomes taboo, and when a simple question confirming the existence of the Party office exposes the Achilles’ heel of a grand project. Exactly. Totalitarianism isn't about some cool scenes with tanks and blood in the street – and Nima's cool but totally superficial and symbolic "no" to such spectacular events. The true muscles of the totalitarian machinery only start to act after the tanks and blood are removed from the sidewalks (the same is true for the German and Soviet tanks in Prague in 1939 and 1968, too). The employees are being ideologically filtered, fired, or arrested, the history is often being rewritten, and there are reasonable worries that this totalitarian treatment won't be quite confined to the Chinese territory and the set of Chinese citizens. I think that it's right to praise China and even the communist party for funding the project and I would even okay the proposal to name it the Mao collider – because that's exactly the symbology that may be important from the Chinese viewpoint but the rational Westerners could generously say that the name doesn't matter and they're still willing to help if needed. But China could gain such a global monopoly over the experimental particle physics and maybe even phenomenology that it could basically filter the whole community and make everyone who works in this discipline in the world compatible with the interests of the Communist Party of China. In my opinion, Western institutions or companies that cooperate – e.g. deliver some components that China cannot complete by itself (Cheng totally realizes that the dominant Chinese strategy is to buy one copy of Western technologies and clone it all over China – unfortunately, my classmates working for Škoda Transportation say the same and their tone isn't happy) – should preemptively think about possible types of pressure that the Chinese hierarchy could exert. Would they fire a person XY who has said something unwelcome about communism or the Chinese communism etc. if the Chinese official threatened that they would cut one type of a contact with the institution or another? If they threatened to cancel the collider altogether? And there are lots of similar questions. If the answer were "let us tolerate this Chinese communist influence", there should still be a possibility to hire experts at places which are completely independent of the Chinese hierarchy of power. Cheng says that science must be Cosmopolitan etc. Well, science as a principle is nation-blind but in the real world, science may be done by (or within) nations and associated with (or credited to) nations – or with any people or groups of people that aren't quite neutral or representative from social or political perspectives. It may sometimes work. I wouldn't be too dogmatic about it. But worse things may happen: China may eliminate politically inconvenient professional people in a whole important discipline of physics in the whole world. If that threat were genuine, then I think that the Western institutions should generally refuse to cooperate on the project. It would be better to let it die – if some Western help were still needed. I can imagine that similar threats are justifiable. Many of my colleagues, Western or Chinese, asked me about my priorities and whether I cared more about physics or human rights, as if these pursuits are mutually exclusive. Exactly. The question "is physics or human rights more important" is already being asked in order to intimidate the person who is being asked. I know this kind of intimidation extremely well from communism – but, sadly enough, from the politically correct U.S. institutions, too. You know, the assumption is that this question is just a rhetorical one and "every physicist who got this far is obliged to answer that physics is more important than human rights". I am not sure what's more important but what I am sure is that it's a tremendously serious problem when people are pushed so that they must only choose one of these two things. Equivalently, I could – and many people, including great experimental physicists or engineers or particle phenomenologists could – very well answer that the "human rights are more important than physics [well, just this single physics project], after all". You know, the whole trick of the totalitarian system is that it can already abuse – and it has often abused – this answer to fire the inconvenient person. The communists or Nazis or feminists or anyone who wants to violate the human rights is supposed to continue: "OK, so you prefer something over physics, so you're not a good physicist who must place physics at the top, so it's OK to fire you. We fired you for fair meritocratic reasons linked to your relationship to physics." Do you believe me that I know numerous examples when things like that happened, not only in physics? In the totalitarian everyday life, this exchange between the officials and employees is not an exception. It's a widespread strategy – the fact that exchanges like that take place is basically a rule. I know that this is how the totalitarian systems impose their political control over the workplace, Dr Cheng seems to know it as well, while all the Western scientists are clueless or pretend to be clueless – I will return to this question later. Now, the justification of the dismissal of the person is absolutely fraudulent – like the totalitarian systems themselves. The fact that the person placed human rights above physics doesn't mean that he's a bad physicist. It doesn't even mean that he or she isn't the best physicist. What the person was actually fired for was his political and human values that were found inconvenient by the totalitarian regime! You could say that the people who are convenient are never asked "similar tough questions" – it's OK for them to place political values over physics! This is where the ideological filter separates the convenient and inconvenient employees. The inconvenient ones are simply fired – and to make this treatment look pretty, they're selected for some "tough questions" to mask the political motivation of the dismissal. To some extent, this treatment of the scientists and citizens is almost guaranteed to take place in contemporary China and we can't do much about it – it would be an intervention into China's internal affairs and we can't do it effectively, anyway. But it would be extremely serious if such a type of interactions between science and politics were spreading in the West. (Well, I am generously neglecting the fact that the feminists-controlled politically correct "party offices" have basically asked equivalent questions to me, too. At that moment, I knew it was unthinkable to continue to work in that environment.) Unless he or she is comprehensibly warned and explicitly and separately gives up his or her rights, a Western scientist should have the right to place human rights above a physics project with no implications for his job. If it became the default assumption that a scientist may be fired if he says a similar inconvenient thing for the Communist Party of China, I would prefer to ban the Western institutions from participation at the Mao collider project. Cheng also talks about military-related abuses of the scientific discoveries (which could emerge even though most of the participating scientists could disagree with this application of their work). I don't expect any discoveries that would be useful in this sense so I don't want to discuss this aspect in detail. However, I want to express some feeling about "the reasons behind the indifference" of the "cooperating", pro-Chinese Western scientists. One could say that they're naive. They've been told that China basically respects the human rights and doesn't want to force its ideology on the – Chinese or foreign – physicists and engineers. It could be just their naivity. Well, I am afraid that if Dr Chenge believes it's just naivity, she's naive, too. Sadly, I think that it's much more accurate to say that the values and interests of these Western physicists and other scholars are basically aligned with the values and interests of the Communist Party of China. They say that China only does things that are great because they want to impose such things, too. A majority of the U.S. scholars are sufficiently radically left-wing so that they could be considered Marxist. I don't think that it's the most accurate adjective expressing the politics of Nima and others but it's close. At some moment, Nima would return from a political lecture by Noam Chomsky – as if it were some spectacular event. I could never understand why people would waste their time with similar garbage. Their desire to get exposed to this garbage is even crazier if they're people whose families escaped from a totalitarian regime. Now, if you remind yourself about the political opinions of Chomsky, you may see all these strange labels such as "anarcho-syndicalist", "libertarian socialist" etc. But concerning Marx, Chomsky still praises Marx's contributions to the political thoughts and he even described himself as an anarchist with radical Marxist leanings. I hope that I didn't make the dear TRF readers throw up. Chomsky's views on the Chinese communism are even more shocking. In 1967, he would praise the Chinese changes as "quite admirable". They "didn't deserve a blank condemnation". There were even better examples in China, it was a great example of a new society, with interesting positive things and so on and so on. Holy cow, this was said on the second year of the Cultural Revolution (1967-1976). Aside from lots of other bad things, Mao has killed some 78 million people – he beats Stalin, Hitler, and everyone else. Now, if Nima tends to identify with Chomsky, it's easy not to be surprised that he finds the political framework surrounding the Mao collider just fine. You know, Nima is great and he has rights for his opinions. But he won't build the collider with his own hands. If some other Westerners cooperate, including postdocs and graduate students, they should think twice. The project will almost certainly have some powerful supervision by the Communist Party of China and the leaders of the Western limbs – including Nima – have clearly been chosen partially according to their compatibility with the ideas about the co-existence of science and politics that are favored by the Communist Party of China. If you have ever thought that this system could be considered really pathological, you should realize that by joining this project in one way or another, you could be controlled or removed in a similar way. Maybe the worries will turn out to be unjustified. It is plausible that the basic human rights of the scientists – at least the non-Chinese ones who touch the project – will be respected. But like Dr Cheng, I insist that unless all the Western scientists want to collectively become useful idiots, to use the famous Lenin's phrase, we know that this outcome simply can't be naively expected and trusted. The Communist Party of China is very likely to use and abuse the project for its own political interests and responsible Western scientists, institutions, and companies cooperating with the project should be ready to defend at least the basic pillars of the Western decency. Some red lines must be negotiated in advance. If some fundamental things can't be negotiated while "politics may kill this project", then I am afraid it's right to say that the project should be killed. But the example of the astronauts understates the potential for a highly pathological political interference in science because every other pilot can be an astronaut – it's not a terribly special job, especially from an intellectual viewpoint. But physicists simply need some independent thinking. Physics, including experimental particle physics, is much less "automatic" and "driven by orders" than the job of an astronaut. 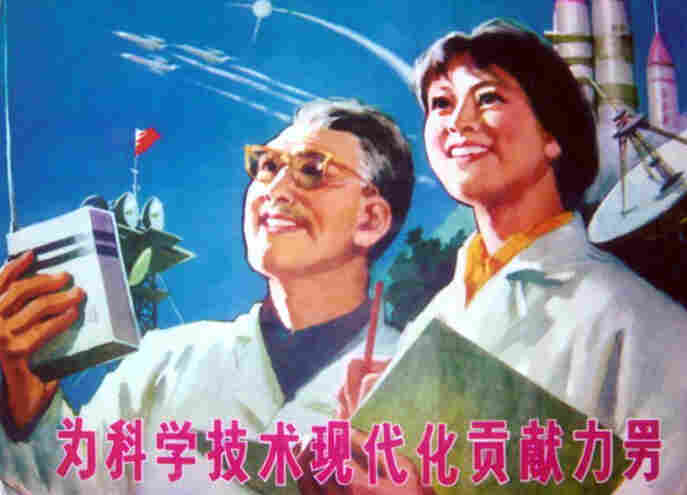 The prosecution of cosmology and astrophysics in China of the 1970s or genetics in the Soviet Union between 1920 and 1964 are cautionary tales we simply cannot forget because they could be relevant for particle physics in the age of the Mao collider, too. People with particle physicists' hearts are naturally enthusiastic about a collider that is twice as big as the LHC. But once you're asked whether "physics is more important for you than human rights", think twice what is actually going on and whether you want to cooperate with it or start the alarm bells. By the way, I hope that everyone in China appreciates that this weblog is inaccessible in mainland China due to the government-run censorship scheme. Discussions about such important questions are probably impossible in China. Even blog posts such as this one could be a problem. So whether you're a party official or anyone else in China who visits this blog – probably through VPN – I want you to be responsible for any consequences that result from your having read this page. If you don't know what you're doing, please don't even mention that you have read it. On the other hand, I do think it's important for reasonable people to deal with the potentially serious risks that the political system may pose to the Great Collider of China.